Earn $25.40 in Rewards credit (2540 points) What's This? Single-chainring simplicity is coming to your road bike with SRAM's Force 1 Carbon GXP Crankset. The unidirectional carbon arms are as light and stiff as racers have come to expect from the Force lineup, and the removable alloy spider means you could opt out of the included 110 BCD spider and move up to 130 BCD if you're looking to run a 52 or 54 tooth single chainring for monster efforts. For mere mortals, the included 42T X-SYNC™ narrow-wide chainring will provide you with all the gears you need when paired with a wide range 11-speed cassette. 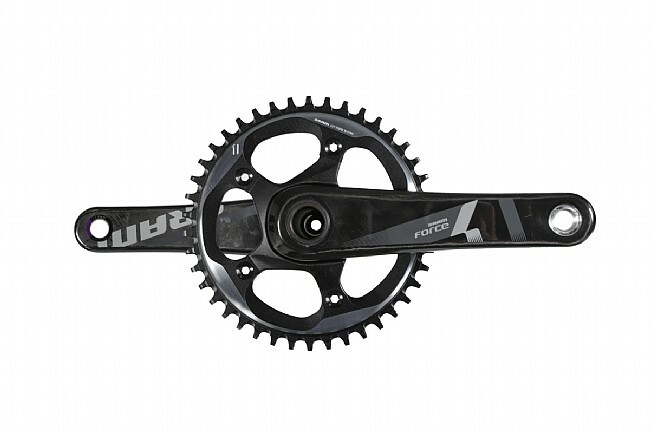 The Force 1 Carbon GXP crankset weighs approximately 609 g (172.5 mm length w/ 42T chainring). 110 mm BCD. GXP bottom bracket not included.